Eugenia and Baby Lincoln may live next door to a pig, but that doesn’t stop them from living a gracious life. And the amiable Mercy Watson is equally determined to follow the delightful scent (and delicious taste) of the pansies her thoughtful neighbors are planting to beautify their yard. "Where have all the flowers gone?" shouts Eugenia, who is finally ready to take extreme measures —- and dial Animal Control! Has Mercy’s swine song come at last? Or will her well-pampered instincts keep her in buttered toast? Mr. and Mrs. Watson and their porcine wonder, Mercy, are off to the Bijou Drive-In. What will happen when the Lincoln Sisters, Frank, Stella, and a gaggle of familiar characters get the same idea for a night out? With the tempting scent of hot buttered popcorn wafting through the air, everyone’s favorite pig leads the way in this hilarious romp featuring movies, mayhem, and Mercy! Kate DiCamillo is the author of The Tale of Despereaux, which received the Newbery Medal; Because of Winn-Dixie, which received a Newbery Honor; The Tiger Rising, which was named a National Book Award Finalist; and The Miraculous Journey of Edward Tulane. 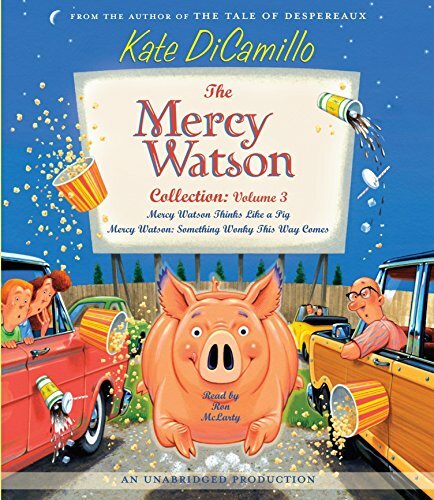 These books as well as The Mercy Watson Collection: Volume 1 and The Mercy Watson Collection: Volume 2 are all available on audio from Listening Library.